I went to Nashville last week to visit a good friend. She apologized for not having a stocked fridge for my arrival, but proceeded to list the things in her freezer and pantry that I could eat. I have two bagels, but no cream cheese. Bread and jelly, but no peanut butter. I felt sorry for her fridge and decided to restock it with easily re-heatable meals. After getting lost and taking a long detour, we finally found an international grocery store. Despite being one of the “better” international grocery stores, this place was meh compared to places I’ve grown up with. After browsing the sparsely stocked aisles, I managed to find some off label hot bean and sweet bean sauces. I wanted to make my jia zhang noodle sauce, but they didn’t have beancurd. 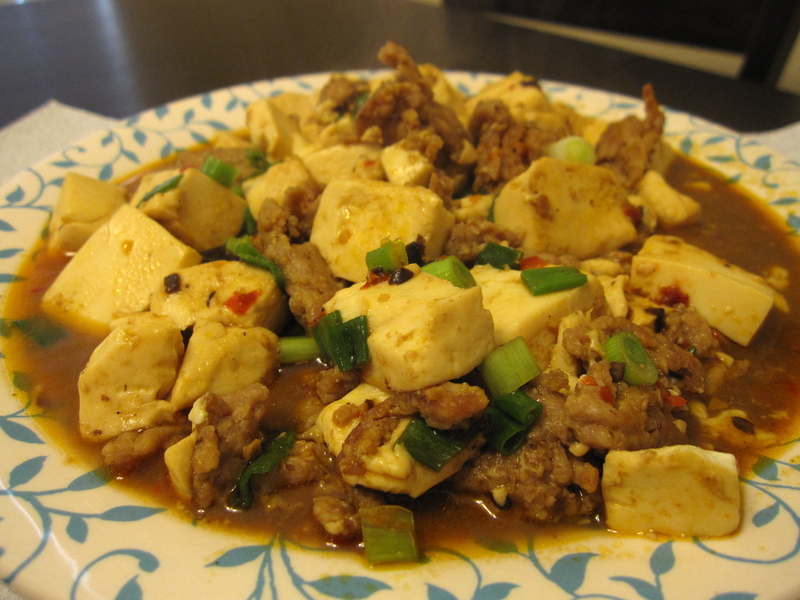 So I made some makeshift mapo tofu instead. Saute 1/2 pound of ground pork, throw in one package of soft tofu (cut into 3/4 inch cubes), sauce mixture (3/4 cup water, 2 tablespoons of hot bean sauce, 2 tablespoons of sweet bean suace), and a dollop 1 tablespoon of red chili garlic sauce. Toss in chopped green onions at the end. I’m not sure how freezer friendly the soft tofu is, but I hope it re-heats well! I also made a pork & bamboo dish. Marinate sliced pork tenderloin for 5 minutes in soy sauce, sesame oil, and a little bit of vinegar. 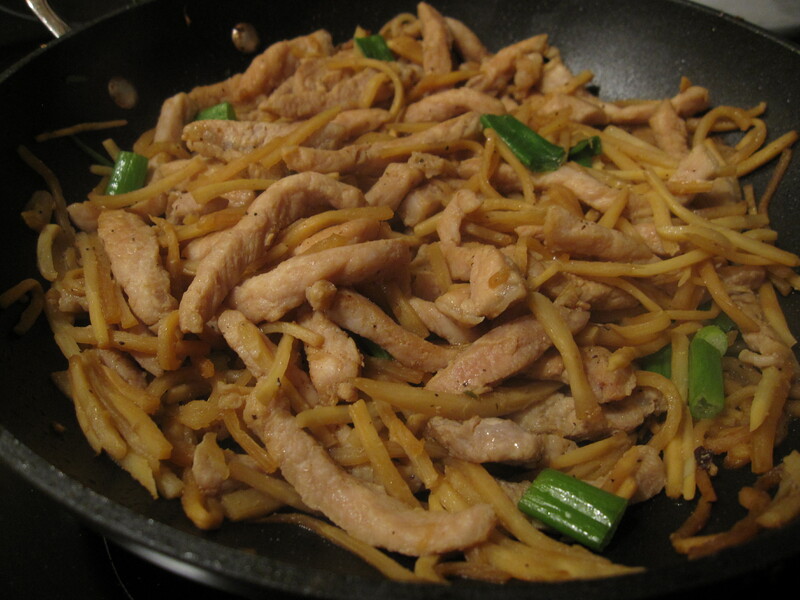 Saute the pork and add bamboo shoots. Season with S&P and any additional soy sauce, as necessary. Janet, hope these dishes lasted you for a while and you aren’t back on your taco stand tacos, then stomachache, then Sprite + saltine crackers diet. Love you! Yum – I am so making these someday soon! Miss you!